Which States Have the Highest Income Tax Rates? A recent report from the Tax Foundation breaks down income tax rates among each of the 50 states. Rates range from none to as high as 13.3% (California). 43 states have income taxes, 41 of which tax income while two states only tax interest and dividend income. However, one of those states (Tennessee) is in the process of phasing out its Hall Tax (a tax on interest and dividend income) and is scheduled to repeal its income tax entirely by 2022. The remaining 7 states do not tax income at all. The map from the Tax Foundation below illustrates the tax rates in each state. Of those states that do tax income, 8 have single-rate tax structures, with one rate applying to all taxable income. There ere 33 states which use graduated-rate income taxes, with the number of brackets varying widely by state. The Tax Foundation notes that Hawaii, California, and Missouri are at one end of the spectrum with the most brackets. Hawaii has 12 tax brackets and California and Missouri have 10. Kansas is at the lower end with only two brackets. Top marginal rates range from North Dakota’s 2.9 percent to California’s 13.3 percent. The Tax Foundation’s full report has additional details from their analysis of income taxes in each state. Many federal retirees wonder about which states are the most tax friendly for retirement income. 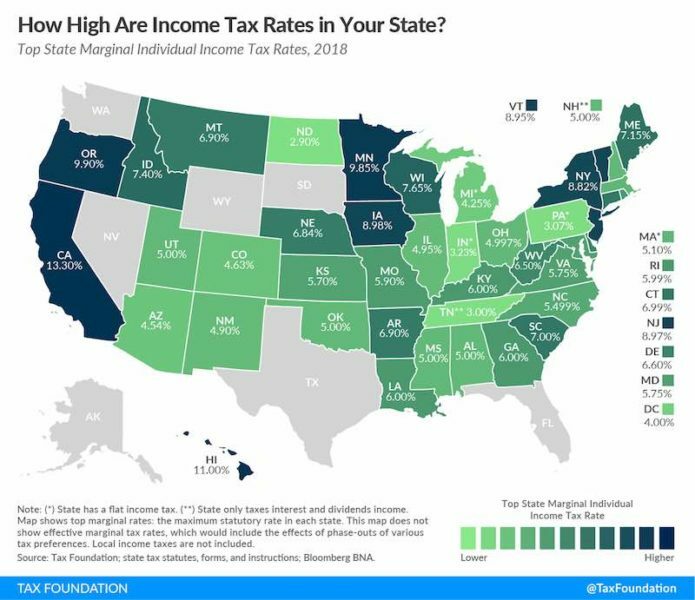 A recent study by GoBankRates compiled data on sales, property and income taxes (including Social Security) to put together a list of what it found to be the best states in terms of taxing reitrment income. One thing each state in the top 10 had in common: no tax on Social Security income. Alaska came out as the top state on the list. Kiplinger also has a state-by-state guide ranking states in terms of their desirability for retirees from a tax standpoint. Deciding where to live after retirement is a personal choice as well. While Alaska might be a great option in terms of low taxes on your retirement income, it also is cold, is far away from the rest of the U.S., and has a higher cost of living than other states. While state taxes are important, anybody planning on relocating after retirement would likely want to weigh a variety of factors before making the move. How High Are Income Taxes in Your State? Should Social Security Benefits Be Taxed?